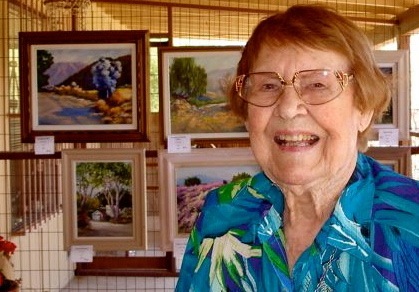 Sally Ward, an artist who lived for decades in Palm Springs, died in Tucson on November 16, 2010, at age 101. 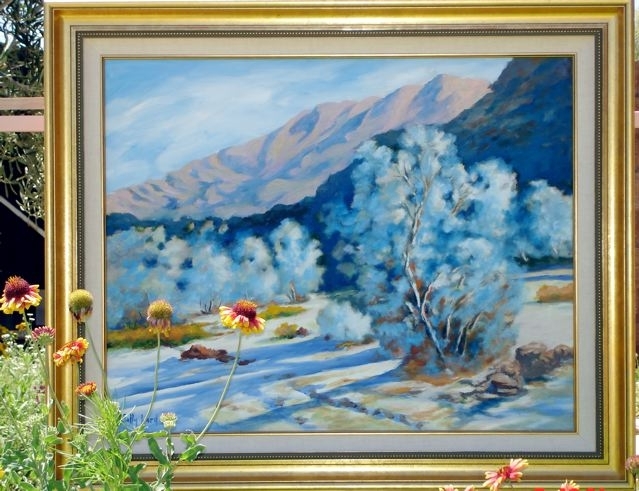 Fellow artists from Ward’s circle of friends who also passed away recently include Louise Tennyson and Edna Hollinger. All were part of a roving bunch of plein air painters from the Palm Springs Desert Art Center. They explored the canyons together and benefited from acquaintance with older, experienced landscape painters such as Wilton McCoy, Darwin Duncan and Karl Albert. Sally Ward was born in Montana and moved to Palm Springs in 1973. Like her friends, Sally was serious about her work, and was always trying to improve even after moving to a Tucson nursing home. Here’s an excerpt from a faxed note she wrote to fellow painter Tennyson when Ward was 98. The younger Tennyson was in a painting slump; and Ward here tries to cheer her on. Ms. Ward with an art/pottery exhibition. When and where will that occur? I’m new to the desert and sorry that I missed seeing her work. What a wonderfully, creative life she enjoyed. My condolences to her family. For details on the event honoring Sally Ward, please get in touch with her daughter, Sue, at saward1@juno.com. If I hear anything I’ll also post it here. always remember her great talent.